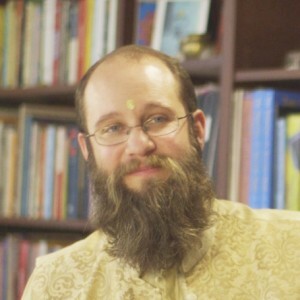 Freedom Cole is a teacher of Vedic Astrology, Yoga and the Vedic Sciences. He teaches with the traditional usage of Sanskrit, meditation, chanting/mantra through modern technology. He teaches traditional Vedic Astrology in a practical way which is useful in the modern world. Freedom’s teachings are filled with the deep understanding of the unity of all things. Freedom studied with various astrology teachers in the US and India until meeting Paramguru Pandit Sanjay Rath in 2001 and studying in the lineage of Sri Achyutananda. He has lived for extended periods in India studying with his Jyotish Guru in in Delhi, Bhubaneshwar, Puri and the Kamoan Himalayas. He was given the diksha of the sacred thread by his Sanskrit Guru Vagish Shastri of Varanasi and was given his Vaisnava diksha by Baba Balia of Orissa. Freedom is dedicated that people have access to true Vedic knowledge within a modern context. He focuses on using this knowledge to free the mind and give a universal perspective. Freedom shares the gross, subtle and transcendental level teachings in all topics of discussion. Freedom’s personal website is www.shrifreedom.org.